Should You Pay For an Online Press Release? This question easily parallels other similar questions like: Should I hire an SEO consultant? Should I hire a web author, a graphic artist, a virtual assistant, and audio editor? Clearly, “shopping” or outsourcing time-consuming tasks not in your skill set is recommended. Not only does this free-up time for you to do other tasks more suited to your wheelhouse, but you help out other freelancers with their business flow. Press Releases or News Releases are a unique art form. A lot of really good ex-journalists are now making more money writing press releases than they made in the newsroom. A good press release is full of trigger words and quotes…lofty language, and single-minded dedication to one goal. It has an agenda, and seeks to elicit a response, hopefully a call to action by the reader. In short, there’s a real science and protocol to writing a good press release, and it’d be easy to think it best left to a professional. Nothing wrong with that. The newest tweak to this model is the Online Press Release. These outfits have proliferated on the web. One of the most prolific is PRWeb. Checking into any of these services, you quickly see the fees can get steep. So the question is Should You Pay for an Online Press Release? What’s their reach? How do they operate. What is my ROI? A great article by KunoCreative comes close to answering this question. Many entrepreneurs naively hire a PR firm to launch their nascent products in the hope of leveraging the firm’s industry contacts. The sad reality is that PR firms value their affiliations with media and industry gatekeepers more than their relationship with any single client. This causes even the most earnest third-party PR professionals to champion your message in a measured, pedestrian manner. As soon as they encounter resistance from a trusted media compatriot, they invariably back off and protect their long-term relationships, rather than champion your solution. Public relations at a startup is a sales process. Creating marketing awareness requires passion and persistence, two attributes which are in short supply at most PR firms. Moderate persistence can be purchased, but passion can never be outsourced. As such, startups must directly tell their story in their early days, to ensure it is received unfiltered and with the fervor that only a wild-eyed entrepreneur can deliver. I love that: “passion can never be outsourced”. That’s going down in my book of favorite mottos. P.S. 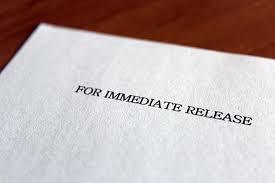 “Press Release” is pretty old school…but it won’t die…even though news media is no longer bound by printing-press technology. I prefer “News Release”, or Media Release.